The method for installing new ski bindings will depend largely on what kind of skis you have, and what changes you wish to make. In most situations it is best to have a professional ski shop or repair shop handle this installation. If you do make mistakes in the process, the results could include injury while on the slopes. In many cases it is affordable to have a ski shop handle the installation of bindings. If you are willing to do it on your own, be sure to know what is involved before starting the process. Remember that the binding is what attaches your boot to the ski. It is important that this binding is secured properly so your ski remains secure while in use. The binding will lock your boot in place so that any motion will not result in losing the ski. Before installing, be sure that the correct binding is selected for the type of ski you're using. The experts at REI recommend having a professional determine the best position for mounting your bindings as well as how to properly adjust your bindings for your particular needs. Since most skiers prefer to have their bindings installed by a professional, many do not know that this can be done at home. Carefully read all instructions that come with your bindings. Each manufacturer may recommend a different method for installation. Some bindings may require special tools for the installation. Snap the toe of your boot into the toe piece of the ski binding. Using a ruler, make sure the holes are all evenly spaced and center the boot along the width of your ski. Mark the holes from the binding onto the ski. You can use a marker to make a small dot through the screw hole. Remove the toe piece and set it aside. Find a drill bit that will match the screw size for your binding. You will want to choose a bit that is smaller than the screw and then attach it to your drill. Carefully drill out the holes that you marked. You will want to drill halfway down. Do not drill the entire way through the ski or you will damage your ski. Fill each hole halfway up with epoxy glue. Lay the toe piece of the binding over the holes and insert the screws and begin tightening. Wipe away excess glue with a damp cloth. Allow glue to dry completely before inserting your ski boot. This process takes between 4 and 24 hours. Repeat the above steps for the heel piece of the binding making sure that the binding lines up the center of the ski. Repeat all steps on the opposite ski. After you install your ski bindings, consult a DIN chart. A DIN chart lists the skier's weight in pounds and gives the DIN setting range for each weight. This chart will help you make sure that you have the correct setting for your ski bindings. You will want to test your bindings before heading out to the slopes. To do this, simply twist your foot either to the left or right while placing your boot in the binding. 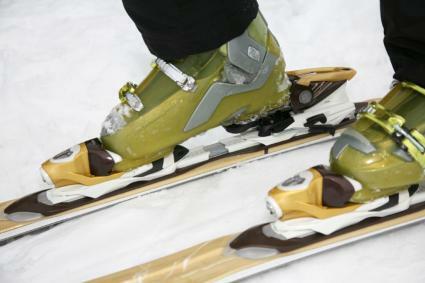 If your boot is secured properly in the binding, the front bindings should open when performing the twist motion. Your bindings will be adjusted according to the DIN setting. This setting is important since a setting that is not correct can result in your ski release being too loose or too tight and can cause serious injury while skiing. It is a good idea to have your bindings checked regularly. Depending on how often you ski, this should be done several times in a season. Aggressive skiers may want to check their bindings after each time they ski.